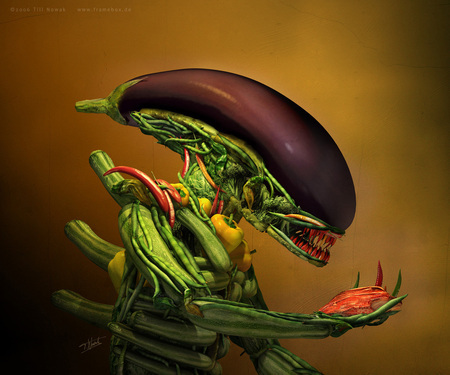 Till Nowak is a 3D Max Ace and using vegetables he has created a fantastic digital image of the Alien. 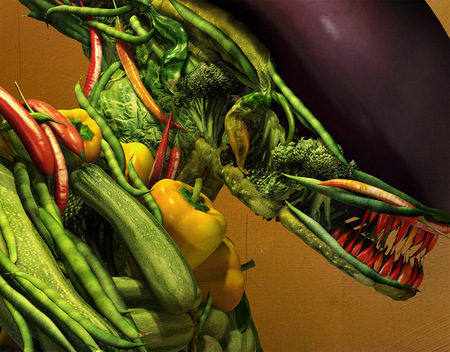 Till Nowak modeled twelve digital vegetables in 3ds Max using classical polygon modeling techniques. Photographs of fresh vegetables were used for the texturing process. Most of the vegetables started with a cylinder primitive and needed around 30 minutes of work. The modeling was easy – it was much more difficult to find the right places and orientations to build a monster with it.